Mitsubishi Electric has taken another step forward in the company’s attention to innovation by launching air conditioner voice control capability. All air conditioning units installed with Mitsubishi Electric Wi-Fi Control now offer hands-free operation thanks to newly added compatibility with Amazon Alexa and Google Home. The technology gives consumers the freedom to control their unit through voice control via their smart home hub. Mitsubishi Electric Australia national product manager, Atesh Mani said that the new voice control feature was developed in response to consumer demand and is a milestone in the company’s commitment to pioneer a better tomorrow. “We listened to our customers who wanted to integrate heating and cooling into their smart home. The addition of Amazon Alexa and Google Home compatibility to Mitsubishi Electric Wi-Fi Control provide our customers with a smart air conditioning solution,” he said. As Australian homes evolve to a hands-free way of living, this innovation answers consumer demand for ultimate home comfort. Just as playing music or checking the news is as simple as speaking to your smart speaker, so is controlling the air temperature, Mani said. The new connectivity feature is simple to activate across both Google Home and Amazon Alexa. Consumers only need to link their smart speaker account to a Mitsubishi Electric Wi-Fi Control account. 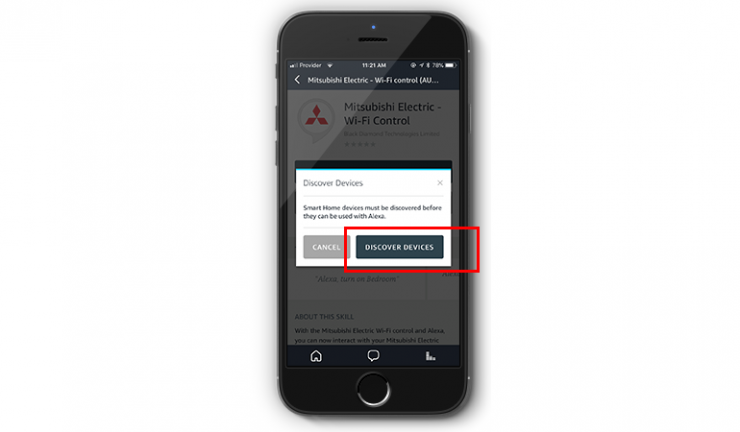 Once the two apps are ‘introduced’, Mitsubishi Electric Wi-Fi Control is discoverable alongside any other smart home devices within the smart speaker’s app.